ZRA are at The Post now trying to gain access to all the servers and even personal phones and laptops. They have failed to close the company because of taxes and State House has failed to find loopholes for the leaks from the government and they know The Post has a good case in court. So now they just want to search everything hoping to find something in there. This is simply fishing for Red Herrings. The ZRA officials are with OP officials and possibly plain-clothed police and they have people stations at all buildings including at the headquarters on Bwinjimfumu Rd and at the printing Plant where the newspaper is printed from. 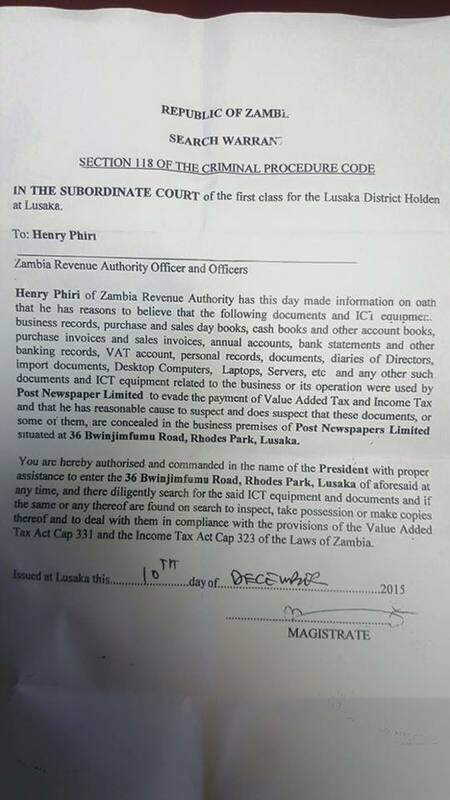 This is the search warranty the PF police and ZRA are using to search Post newspaper offices. The warrant authorises ZRA and the police to search personal records, diaries of directors, servers laptops etc… This level of desperation is shocking.